At Home With The Hansens: Oh Happy Day! Fantastic news! Pumpkin spice lattes are back at Starbucks!! Let the season begin! Clear room in your closet for sweaters and pack up the tank tops cause folks, cool weather is just around the corner! 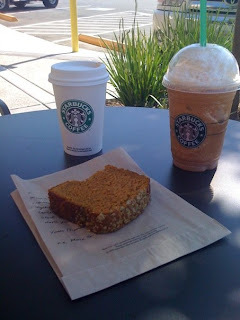 Chris and I enjoyed our first seasonal drinks of the year, along side a piece of pumpkin bread:) Yum! You didn't think I was going to let this go uncaptured, did you?